The following information is compiled from the DVD liner notes and the 23-minute documentary on the DVD. Paul Brickhill, who wrote the book from which the film is based, was piloting a Spitfire aircraft that was shot down over Tunisia in March 1943. He was taken to Stalag Luft III in Germany, where he assisted in the escape preparations. P.O.W.s received many seemingly useless items from a charitable group called American Ladies for the Support of Our Prisoners of War. Soon, however, the prisoners realized that the objects contained radio parts and German currency -- vital to the escape attempts. Red Cross packages often provided prisoners with chocolate and other delicacies that their German captors did not have, giving the prisoners valuable currency to trade for tools needed in their escape. Approximately five million Germans were assigned to search for the escaped P.O.W. 's, and many thousands were on the job full time for weeks, redirecting valuable manpower from the Nazi war effort, especially important as D-Day approached. Director John Sturges read Brickhill's book in 1950 and saw the possibilities for an epic film adventure. Not everyone shared his enthusiasm, however. Sturges, under contract to MGM, tried to interest studio chief Louis B. Mayer in the property, but was quickly turned down. "What's so great about an escape where only three people get away" was a common refrain. The lack of a female romantic interest was also seen as a drawback, and only after Sturges scored a major success with THE MAGNIFICENT SEVEN did he have the power to get his dream project produced. But a major challenge still lay ahead: finding a leading man. Sturges had helped make Steve McQueen a star with THE MAGNIFICENT SEVEN, but the actor was reluctant to take the role of "Cooler King" Hilts. McQueen's two previous films had been World War II stories, and both had generated disappointing returns at the box office. Sturges persisted, and after McQueen read an early script draft, the actor agreed to join the cast with one stipulation: McQueen, a motorcycle enthusiast, wanted his character to escape by motorbike at the end of the film. Sturges relented and had the script rewritten to include what would be THE GREAT ESCAPE'S most famous sequence. Six writers worked on the script which went through 11 versions. After principal photography concluded, Elmer Bernstein composed a memorable score that ranks among his best. 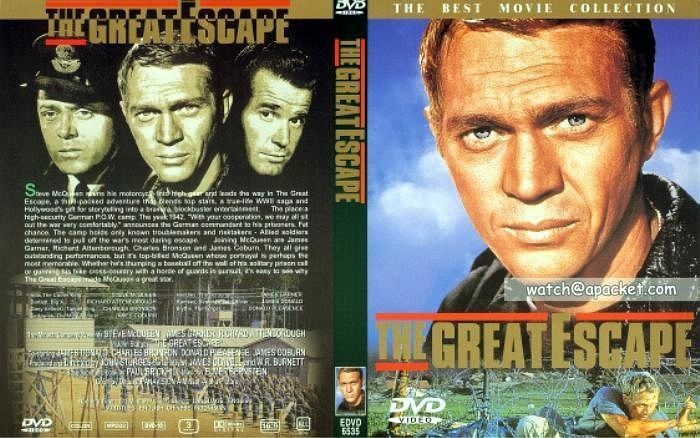 THE GREAT ESCAPE was released by United Artists on July 4, 1963 to enthusiastic critical reviews, and box office receipts soared as audiences came to witness what is generally acknowledged as one of the best war pictures ever made, and a thrilling testament to the indomitable human spirit. The film was shot entirely on location in Europe, with a complete camp resembling Stalag Luft III built near Munich, Germany. Exteriors for the escape sequences were shot in the Rhine Country and areas near the North Sea, and McQueen's motorcycle scenes were filmed in Fussen (on the Austrian border) and in the Alps. All interiors were filmed at the Bavaria Studio in Munich. Hundreds of extras were recruited from a university in Munich, but to save time in the casting schedule, Sturges gave bit parts to grips, wardrobe personnel and his script clerk. During the climactic motorcycle chase, Sturges allowed McQueen to ride (in disguise) as one of the pursuing German soldiers, so that in the final sequence, through the magic of editing, he's actually chasing himself. Several cast members had been actual P.O.W.s during World War II. Donald Pleasence was held in a German camp (Stalag Luft I), Hannes Messemer in a Russian camp and Til Kiwe and Hans Reiser were prisoners of the Americans. James Clavell who co-wrote the screenplay, had been imprisoned in a Japanese P.O.W. camp during World War II, where his experiences formed the basis of his novel KING RAT. Wallace Floody, a former prisoner-of-war at Stalag Luft III, was hired as the film's technical director. He gave his unqualified approval to the detailed sets, saying that Sturges and the crew achieved an "authenticity that was too real for comfort". 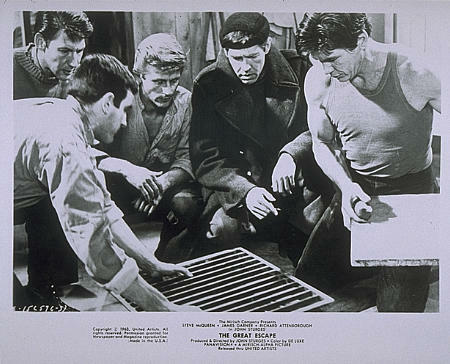 Charles Bronson, who portrayed the chief tunneler, brought his own expertise to the set; he had been a coal miner before turning to acting and gave director Sturges advice on how to move the earth. Although McQueen did his own motorcycle riding, there was one stunt he did not perform for insurance reasons: the hair-raising 60-foot jump over a fence. This was done by McQueen's friend Bud Ekins, who was managing a Los Angeles-area motorcycle shop when recruited for the stunt. McCallum remembered that during their spare time, everyone worked on making the fake barbed wire into which McQueen's character would crash his motorcycle. The film was originally budgeted at $2.3 million, but script revisions, unseasonable weather (it snowed on July 4) and McQueen, who eventually went AWOL, caused what was to be a sixty-day production schedule to more than double--at $30,000 a day, so the production eventually bloated to $4 million. Kirk Douglas and Burt Lancaster were sought for the principal POWs, but their combined asking price of $1 million put them well beyond the budget. Dean Martin and Frank Sinatra, George Hamilton, John Mills and Richard Harris were also mentioned for the leads, with Harris actually cast as Roger Bartlett, but filming ran long on THIS SPORTING LIFE, so the role went to Richard Attenborough. James Garner, cast as the Scrounger, had scrounged for officers in Korea and acknowledged "there's a little of me in the role." Jud Taylor was promised the third American character, Goff---provided he pay his own way to Germany. Sturges: "I had the cast of a lifetime, plus my pick of the best actors in Germany." The screenplay went through eleven drafts by at least a half a dozen writers. William Roberts, Walter Newman, W.R. Burnett and Nelson Gidding, a former POW, each took a crack at adapting the book, but wound up "inventing things," according to Sturges, because they thought Brickhill's story was too farfetched. Producer Mirisch: "The book was the primary source for the escape, but we had to create characters. That's where Jim [Clavell] came in." Originally the film was to be shot in Idyllwild, California with some German locations. But when Reddish and Relyea flew to Munich to scout second-unit locations (train stations, meadowlands, towns along the Rhine), they telephoned Sturges to say how different Germany looked from California. In addition, the Mirisch Company faced labor problems with the Screen Extra Guild which would not allow their members to be bussed farther than 300 miles from Hollywood. Extras in Germany cost only $15 a day, so the filming was relocated abroad. Indoor scenes were shot outside Munich at the Bavaria Film Studios in Geiselgasteig. The POW compound was constructed nearby in a cleared pine forest. The Interior Ministry permitted the American company to clear four hundred trees---the saplings to be replanted elsewhere, the mature trees to be replaced two-for-one. The POW compound was what Sturges called a "360-degree set" that could be photographed from any angle. A reporter called it "the most depressingly realistic POW camp you ever set eyes on." It helped immeasurably, said the director, that some of the actual events in the story "took place not ten miles from this studio." The barracks interiors and a cross section of the tunnel, with fat lamps and operational trolley, were built inside the massive soundstages. During his visits, technical advisor Wally Floody was in such demand, he was passed from department to department---"by appointment only." "You must be getting something right," he told Sturges after squirming out of the studio tunnel, "because I'm having terrible nightmares." Donald Pleasence, a WWII veteran who sat out the war in a Baltic POW camp, also had flashbacks. "It was an exact reproduction of a prisoner-of-war camp, and just as frightening," he said. The cast arrived in early June. Coburn and Bronson were in a Munich hotel. Steve and Neile McQueen had a house in Deining. Garner and Sturges had chalets in Munich. McCallum and wife Jill Ireland rented a guesthouse on Lake Stamberg. McQueen, drawn to the Autobahn by its unlimited speed limit, was perpetually lost. The afternoon he was scheduled to check in, he missed the studio exit by 150 miles. Throughout the shoot, he would infuriate the local authorities by tearing to and from the studio in his Mercedes 300SL convertible. Authorities rigged a speed trap especially in his honor. Because of a rumor the film was in trouble, Sturges screened 45-minutes of dailies from the first six weeks. Not much of McQueen had been shot (or even scripted) at this point, and many of the cast thought the film was destined to be a disastrous flop. McQueen was also jealous of Garner's screen time and his "goddamn white turtleneck". Garner agrees, saying he and Jim Coburn got with Steve "and went over the script, scene by scene. We figured it out. Steve wanted to be the hero---but he didn't want to do anything heroic." Sturges: Steve was "groping around, ad-libbing, trying to figure out how he could make the switch from loner to a member of the 'X' team; I couldn't get Steve to realize that that was his part, the loner. He kept getting upset because he wasn't involved with the mechanism of the escape." McQueen called Stan Kamen, his Hollywood agent, who flew to Munich to calm his client. As soon as he left, McQueen disappeared, saying, "I'm not coming back unless that thing is fixed." Sturges shot around McQueen and told Garner that Steve was out. The following week Steve was back, agreeing to behave. Sturges contacted Ivan Moffat, a war buddy of George Stevens, who had worked on SHANE and GIANT and now lived in England. Moffat's contributions, during a two-week stay, were small but crucial. He wrote the scene in which Hilts tests a blind spot between guard towers by tossing a baseball at the fence and the exchange in which Bartlett and MacDonald con Hilts into becoming their advance scout. Much of the humorous July 4th celebration by Hilts, Goff and Hendley, who buy up the camp's potatoes for moonshine, was improvised, including their comic "Wow!" when they taste the home brew. According to Neile: "Steve couldn't get the timing right, and John [Sturges] stayed on him until he came up with that scorched-throat sound." The escape by train was done with a vintage steam engine and two passenger cars purchased from a junkyard. It was photographed live (no process shots) on the busy Munich-Stuttgart run. The single-engine Bueker 181, a flimsy trainer purchased from a Belgium collector for $250, used by Henley and Blythe in their escape, was piloted by Relyea. The Hilts motorcycle jump, actually done by Steve's stunt double, Bud Ekins, was shot in a meadow outside Fussen on the Austrian border. McQueen did do the rest of his own motorcycle stunts. Sturges: "That's him in beer-bottle goggles playing a German soldier chasing himself." As money started to run out, Sturges cut numerous scenes, including the "mole" breakout by Hilts and Ives, a cooler montage (Hilts eating, doing pushups, etc. ), Blythe coping with his blindness, Danny and Willie in a rowboat narrowly avoiding capture by sentries. The scene of Danny and Willie boarding a Swedish freighter ran into trouble when the captain refused to let Bronson and Leyton do it because he thought the film unit was German. Falling snow obscured the filmmakers, and Sturges yelled to Bronson and Leyton, "Get on the [ship's] ladder! Kick the rowboat away! Climb up the ladder!" The rough cut ran more than five hours. Originally it was planned to release a 3 hour film as a special "roadshow" with intermission and reserved seating, but prime theatres were "illegally block-booked" by competing studios. Additional lost scenes included those between Hendley and Blythe, Hilts refueling his motorcycle and sampling Sedgwick's special escape rations, and Sedgwick trying the American's brew and finally opening his suitcase. Sturges: "It was funny stuff,. Sedgwick, who's Joe Organization, stops by a stream, opens the thing and in it he has food, wine, change of clothes, a compass, and a book. He starts nibbling the cheese, drinking the wine, reading the book. Got a big laugh. But it had to go. Length." Sturges phoned Garner from the editing room. Over lunch the next day, he said, "Jim, the two best acting scenes in the picture are between you and Pleasence. The only thing wrong is they're on the cutting-room floor. I've got to stay with Steve on the bike." (McQueen is onscreen more than anyone---43 minutes in total). Garner: "I thought it was very classy of John to call me and tell me before I got to the preview. I accepted it because of the way it was presented. He was a very classy guy." For his stirring tuba-and-woodwinds score, Elmer Bernstein recycled a martial theme he had written at age 14. Bernstein: It was "jaunty, nose-thumbing in character...adolescent rather than adult and meant as a cheeky counterpoint to the foreground heroics. Apart from that, it was simply a matter of getting behind the action and McQueen's character." It has become the official song of the English national soccer team. When the film was screened for United Artists, they wanted it cut still further. So the scene where the tailor (Robert Desmond) shows 'X' his new line of civilian clothes made from blankets and uniforms was cut. Because UA demanded hefty interest on the $1 million overage, Sturges and Harold Mirisch went to Pacific National Bank for a loan. The board agreed, provided they could see the film. "They loved it, but couldn't understand how the men got their civilian clothes. So back it went." Often when shown on TV, this sequence is cut, however. The world premiere was held in London at the Odeon Leicester Square Theatre, preceded by an RAF benefit and an afternoon screening for Floody and other surviving members of Stalag Luft III, who gave the film a standing ovation. Sturges was designated a "Friend of the Royal Air Force" by the RAF at the London premiere. However, in 2006, camp survivor B.A. James called the film "a load of rubbish; the first part of the film wasn't bad, but the second half was just Hollywood fantasy, an excuse for McQueen to ride his motorbike. There was no motorbike. Nobody pinched a plane either." The film more than doubled its investment, earning over $16 million. 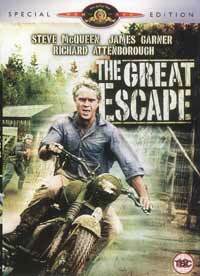 Since its release, THE GREAT ESCAPE has steadily gained in stature as a pop-culture touchstone. In 2001, it made AFI's list of 100 Most Thrilling Movies at number 19. In 2006 Hummer aired a takeoff commercial. The film remains a cash cow for distributor UA/MGM, which released a collector's edition DVD to commemorate the 60th anniversary of D-Day.